Introducing my beautiful gsd Keisha, she is now 23 months old, 54 Kgs. Keisha is a fun loving girl, favourite toy is football, loves swimming and playing in her pool. Keisha attends dog class weekly and has achieved her puppy,bronze and silver good citizen awards, currently working to achieve gold. She is apple of my eye and I am so proud of her. 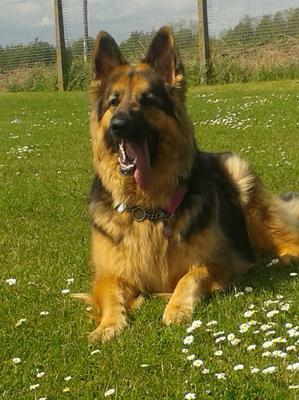 Your GSD Keisha is truly beautiful! You're absolutely right. And thanks so much for sharing her with us all her today! She looks to be in wonderful health in the photo you have sent in of her, happy and just having a great life in general! You should definitely be proud of her for sure and I wish you nothing but the best with her. And I am so proud of you for getting her in all those training classes! That is excellent. I am sure you can attest to everyone just what a little Einstein you have there. And that little furry girl has a great creative, mind and is ready to learn and willing to work. And that is just one important aspect of a German Shepherd that so many people simply miss out on. They are smart! And they want to work! So if you can address these 2 areas in your GSDs life, you are well on your way to having one well adjusted German Shepherd. So thanks again for sharing your lovely Keisha with us all here today. Keisha is so Pretty! She loves the water, oh I'm jealous I wanted my girl, Mia, to Love the water, we have a pool and I tried for her to get used to it, hates it, she only drops her balls in it and then grabs them out. Take care of your girl and she will take care of you!